Follow this link to see the cruise-in pictures. Car people get up early – we had 89 cars registered before the cruise-in officially opened at 9:00AM, and final count of cars was 123. That total is up from 94 at last year's event. The sun was out, but shade was plentiful – Riverview Park, under shade trees on the banks of the Willamette River, is an ideal place for a car event. We seldom think of "menu" and "cruise-in" in the same sentence, but sooner or later car people get hungry. The Central Lions Club, co-sponsors of the event, were offering their famous Pancake Breakfast. At the top of the park, the Farmers' Market was in full swing, and it appeared that several cruise-in participants discovered the booth that was selling peach shortcake. Aside from that, just across the street the cafés and restaurants of downtown Independence were open for business. Hungry cruise-in participants had lots of options. We'll have lots more photos, a list of the trophies that were awarded, and a list of the sponors that made this event possible, as soon as we can pull them together. 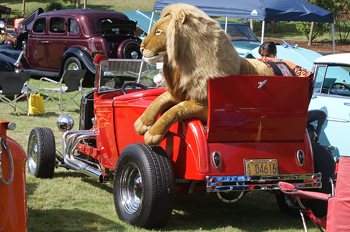 In the meantime, click on the pic of the lion in the rumble seat to see a few photos of the 2013 event. 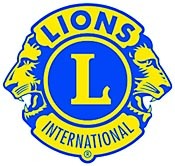 Cascade Pacific Plymouth Club and Central Lions Club are grateful for the support and sponsorship of these individuals, groups, and businesses. With any chance you get, please let the folks know with your thanks or your patronage that you appreciate the support of our event, and the old-car hobby! Click here for the story and pictures from last year's event!